Lin Pardey cruises with Larry Pardey aboard Taleisin, a 29'9" classic cutter custom designed by Lyle C. Hess, built by Larry and Lin of teak and bronze. 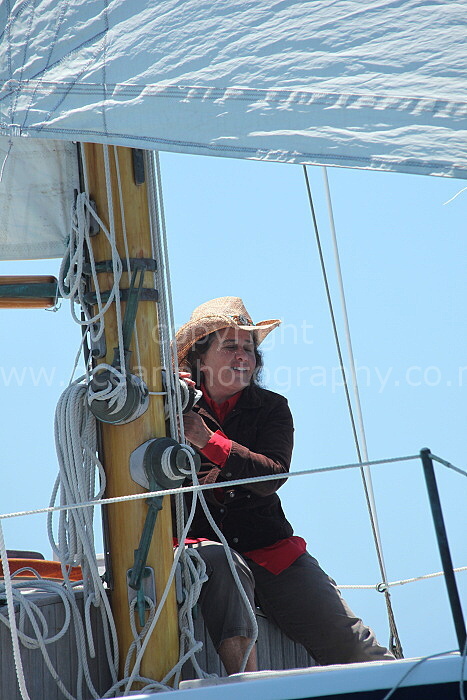 Taleisin hails from Victoria British Columbia but her home port is Kawau Island, New Zealand. Lin & Larry began cruising in 1968 and their most recent voyage was from California via the Line Islands to New Zealand and Great Barrier Island in 2009. They have voyaged approximately 186,000 miles circumnavigating both east about and west about and hold the record for the smallest vessel to have circumnavigated contrary to the prevailing winds rounding the four great southern capes while flying a nylon drifter. For more about them, people can read Cold Hard Facts on their website. 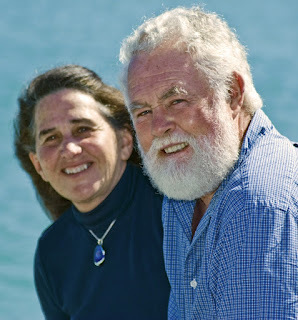 Lin & Larry also publish a newsletter and cruising tips on their website..
What (if anything) do you wish someone had told you before you started cruising? When we first set off in 1968, there was almost no information available for potential cruisers, only a few books about adventuresome voyages plus Eric and Susan Hiscocks very matter-of-fact Voyaging Under Sail that dealt almost exclusively with boat gear and seamanship issues. I met maybe half a dozen folks who’d arrived back from offshore cruises and all they told me was, “Loved it, it was great.” In some ways I think the lack of information sources made cruising easier since I didn’t expect things to go to any set plan. I.e., I didn’t add other peoples worries about cruising to my already active imagination. Is there a place you visited where you wish you could have stayed longer? Southern Africa, San Blas Islands, Argentina. Over the time that you have been cruising, has the world of cruising changed? Of course it has. The most obvious change is – the world’s population has more than doubled and the number of people who can afford cruising boats and the time to leave their home port has gone up by a factor of 10 or more. This has created a large enough group of people to be worth targeting as a potential market for many marine products and services. It has become harder to separate advertising claims from reality, harder to resist adding gear that might not be necessary, will over load your boat and stress your cruising budget. Fact – While we waited to transit the Panama Canal in 1970 we only shared the anchorage with 14 other boats. Only 72 yachts transited the canal during that whole year. I think that many transit in a month right now. When we were in Mexico back then, the only marinas in the whole country were the newly built ones in Mazatlan, Guaymas and Acapulco. Everywhere else you anchored. In La Paz there were a only a few moorings available and those were often suspect. Contrast that with dozens of marinas along the same coastline today. Fact – when we set off very few boats under 50 feet carried radio transmitters. The rest of us used battery operated shortwave receivers. Communications were confined for most part to letters and very occasional land-line telephone calls. Calls between Mexico and USA cost $4.00 a minute. There was no email, no electronic navigation systems. Loran was just being introduced for larger yachts. Safety gear included life rings, bulky life jackets, man over board poles and possibly man over board strobe lights. Heavy weather harnesses had to be home made and were used mostly for very rough weather. The medical kit we carried had to be assembled by us with help from our doctor and the only book we could find to help us at that time was one called, Being your own Wilderness doctor. There were none written for sailors or cruisers. Outfitting costs and operating costs were therefore far lower. Decisions were far easier. In 1970, 95% of those we met felt cruising was a grand way to get out and do a lot of sailing and have some adventures too. Though most of us back then liked turning in fast passages, we pushed our boats to gain bragging rights, not because we wanted to avoid spending an extra day or two at sea. Today when I ask seminar audiences and folks we meet while we are out cruising to describe their thoughts about sailing – very few say sailing in and of itself is an important reason to go cruising and most admit to feeling uncomfortable about being at sea. 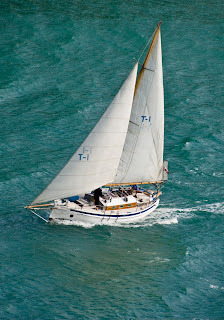 Very few understand how to keep a boat sailing in light winds, many do not have nylon sails on board. Secondly, the word comfort was rarely part of cruising discussions. We were all eager to off cruising any way we could. Yes everyone wanted a good dry bunk, a nice place to lounge. But the search for accommodations to rival those we left behind on shore was much further down the line than good boat performance. I guess we all looked at it as an adventure rather than a lifestyle. Different mind set. I was five years old and sailed with my folks on a 14 foot Old Town sloop on a small lake in Michigan.I remember very little other than the chatter of water along the clinker hull. But I do know my father was in heaven when he was at the helm of that boat. Unfortunately he had to sell it when the family moved to California so that was mostly the end of my family sailing memories. 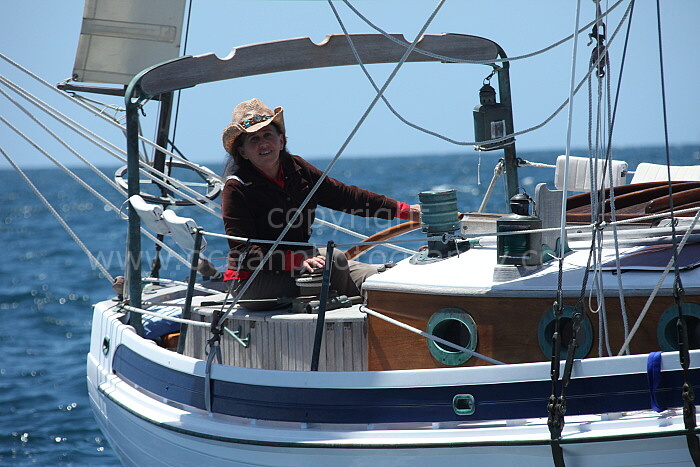 Next first time sailing was with Larry on our first date. He was a professional by then, and had to deliver a boat from Marina del Rey to Newport Beach California (about 40 miles). He needed a ride back to his car and I was the answer. Fifty four foot ketch, beautiful down wind ride in 15 knots of wind, two nice men (he had another crew with him) treating me like I was pretty special. What a great introduction to the world of boats that could cross oceans. Myth 1 - That cruising is easy. That the cruising life is always fun. Life on shore isn’t always fun, or easy. Cruising is challenging, exciting, fulfilling but it is rarely easy. Myth 2 – That an average couple can easily sail a 50 or 60 footer. Maybe they can in perfect or even average conditions. But Larry and I always take crew along when we deliver boats over 40 feet just for those times when we encounter less than ideal conditions. Of the changes, choices and compromises you had to make along the way, which were you happiest and most satisfied about, which do you wish you had chosen otherwise and why? Best choice is still the one that became our motto, Go small, go simple but go now! By choosing to build a 24’4”long very seaworthy boat, Larry and I were able to set sail when I was 24 and he was 29. As you know, this led to an amazingly fulfilling 42 year long voyaging life – and we still love going sailing. Now that we are where we never expected to be, i.e. amoung those called senior citizens, I look around and see few couples our age where both partners still have the physical health and ability to get out cruising. We have watched too many people wait for the perfect boat, enough money in the bank etc. etc. and seen how they missed the wonderful opportunities that still are waiting out there. Taliesin runs along at six and a half knots, her working jib and main set wing on wing, the wind a steady 15 knots from the northeast. The decks are dry and warm. It’s day 14 of our voyage from Ventura Harbor in California to Kiritimati (Christmas island), one of the Line Islands. I have no way of knowing that this will be the half way point, but I do know I have fallen into the routine and mood that makes crossing oceans such an important part of my life. After more than 1800 miles at sea my body has adjusted to the motion. Now I automatically move about the boat in ways that keep me from adding bruises to the collection of black and blue marks I seem to gather along my legs and thighs during the first days of every ocean passage. Lunch has been enjoyed, the cabin sorted out and dinner ingredients organized to be in easy reach when the time comes to cook. Larry is taking it easy below decks, his thoughts far from sailing as he devours yet another of the stack of carefully chosen books we have been saving for this voyage. I relax in the cockpit ostensibly on watch, but in reality savoring the special feeling that only comes when I know we are a thousand miles away from every speck of land. Then there are encounters on shore: I recall the sheer fun of an evening when a crowd of Argentinian sailors came to visit complete with nibbles, drinks and guitars to teach us Tango. We were in the tiny yacht harbor at Mar del Plata. Our goal was Cape Horn and we’d stopped here to do our final outfitting and provisioning. We didn’t want to tell anyone what we planned to do so we could back out if we sailed south and found it to hard for me to handle then sail on toward South Africa instead. So we’d told the sailors we met in the 20 boat marina that we’d come to Argentina to learn to tango. Now they’d brought along friends who sang the songs that brought tears to our eyes as music rang from Taleisin’s cockpit late into the night and the dock beside us became an impromptu dance floor. Sergio, a dark eyed tight bodied local pressed me tightly against his body and tried teach me Tango and show me how to intertwine my legs with his in steps that parodied passion and romance. Clapping and music range out and we managed to keep from falling in the water. Then Sergio danced the perfect Tango with Maria as Larry and I lounged back and savored the party that had happened just for us. What is the most important attribute for successful cruising? Flexibility and a sense of humor is my answer. But as Larry read my answers he asked me to say – Good fix-it skills. What question do you wish I would have asked you besides the ones I've asked you and how would you answer it? Can you still have adventures and meet local people when you get out cruising? Amandla, Amarula, Banyan, Bella Vita, Blowin Bubbles, Brilliant, Calico Jack, Delphinius, Domino, Dos Libras, Fluenta, Georgia, Golden Glow, Impi, Jacaranda, Journey, Lequesteau, Livin' Life, Louise, Maple, Naoma, Pitufa, Palarran, Rocket Science, Ronja, Sunstone, Starry Horizons, Tainui, Tika, Tranquility Bay, Wondertime.